c) Monitor the atmospheric activity of Uranus and Neptune, focusing especially on the cloud formation and wind profile above the stratospheric haze near the southern pole of Uranus, which is now being exposed to sunlight (Rages et al. 2004). Study of Neptune’s atmosphere yield information about the transport of energy and the source of its mysterious internal source of heat (Pearl & Conrath 1991). RIGHT: Simulated H-band GPI observations of Jupiter’s small volcanic moon called Io. 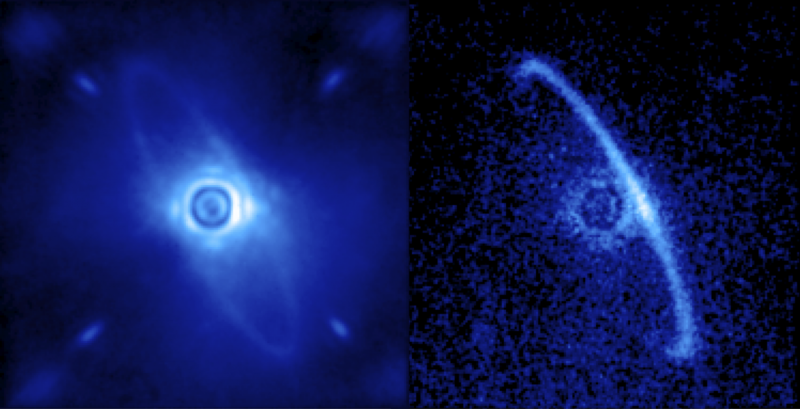 LEFT: a perfect image of Io as it would appear observed from the ground at an angular resolution of 10 mas (spatial resolution of ~30 km at opposition). Surface albedo features such as pateras, plume deposits and SO2 frost regions are dominant on this image. CENTER: simulated Altair-NIRI observation. Right: simulated GPI image. The ALTAIR-NIRI image was derived using empirical PSFs. The GPI image (right) represents operation in non-coronagraphic mode. The gain in contrast and angular resolution is evident. A faint artificial hot spot located close to the north pole of Io is detectable only by GPI. Detection of the thermal emission in J and H bands is essential to pin down the highest temperature component of the magma and relate directly to the internal structure of the Io (Marchis et al., 2002).